Not all of us get tailor made baskets of fruits or fresh bananas. 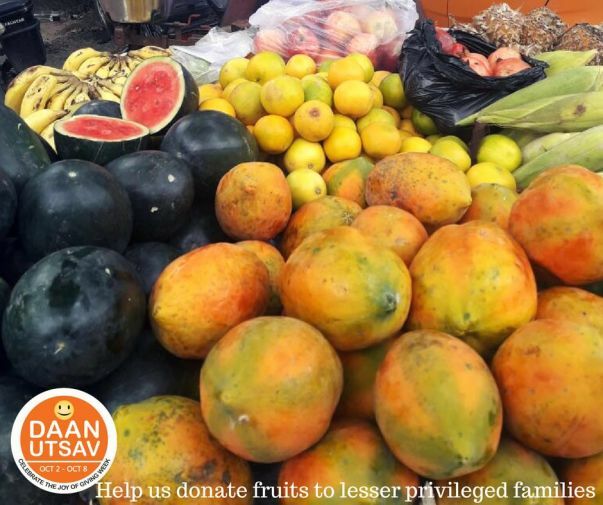 A lot of people from the lesser privileged section don’t have access to fresh fruits and we all know how important it is to have sufficient nutrients for a growing body. So, we are taking an initiative here from our end to reach out to the lesser privileged families living in the L. R Nagar slums, which has over 500+ families living in poverty. Although handing out fruits might seem like a small step, the idea is to provide them with something nutritious and we are happy to lend out a helping hand to those in need. Let’s make it happen and Let’s feed the needy. Your support is all that we need. Thank you for the all the love and support you people have given us. We assure you that all the money you people have contributed will be used in a right way so that the deserved people will be benefited. We have planned to buy good quality apples from it. The cost of apples today is around (for example) rs.100 so we can buy 200kg of Apple from that amount. And further, we have decided to go to L.R Nagar slum and distribute it to 200 most deserving families on 15th October 2017 at 11:00a.m. All the interested donors who have supported us can come there and help us in distributing the fruits.